Welcome to the homepage of Om Rishikesh! Om is known for his refined touch, perceptive palate , and creative vision. Each dish is designed so that deliciousness, elegance, and well-being takes hold of every corner of your life. Allow me to change your life by increasing nutrition and satisfaction in your diet. I offer private cooking and meal consultations, as well as meal planning to fit your needs. This includes but is not limited to, daily cooking, meal delivery and pre-prepared meals. 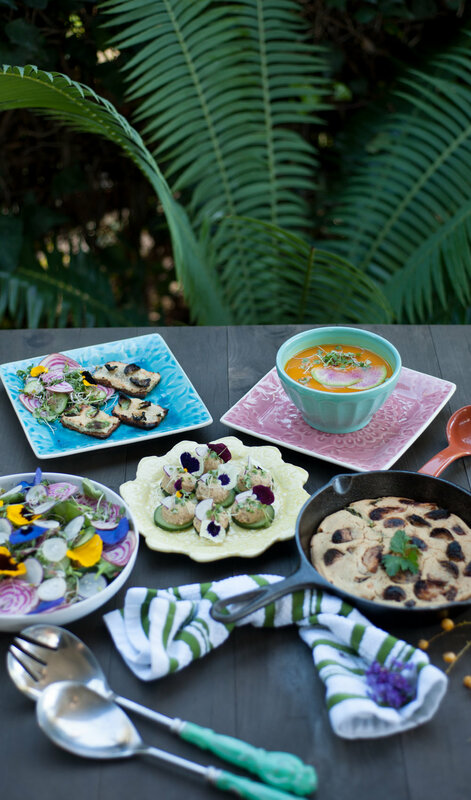 Our Ayurvedic inspired meals will not only feed your guests, but detox their bodies and refocus their minds. From birthdays, weddings, yoga retreats to corporate events, I can create custom packages that will suit your specific needs. Om Rishikesh: Vegan Chef, recipe developer, Floral Arrangement Extraordinaire, Plant-Based Lifestyle Guide, and former Monk. Om Rishikesh reinvents personal nourishment into colorful, thoughtful, and beautifully crafted lifestyles. Pulling upon the traditional cooking of his Colombian roots, the memories of his young mother lighting up the kitchen with her joy for experimental and worldly creations, combined with the culinary training he received within the traditional Indian monastic setting, and later, as a Sous-Chef for Bhagavat Life - Ayurvedic Catering and Culinary School, Om’s passion for his work flowered from deep sentiments for the healing force and beauty of spirituality, family, and compassion. It was through his own uplifting journey of embracing the Eastern philosophy of “Ahimsa” or non-violence and respect for all living beings, that he came to know the transformative effects that a plant-based diet has on immunity, appearance, and positive-thinking. His personal evolution of health, fitness, and self-regulated empowerment is a testament to this, affirming his commitment to nature’s alchemy through cleaner, plant based and nightshade free meals. Om also knows that radiant health is in the details of devotion - knowledge that was imparted to him through his spiritual teachers in the Bhakti tradition, learning the meditative and sacred practice of creating quality foods suited for the Gods! Using food as a form of worship, and having offered consciously-created and exquisite meals to the deities in the temple several times a day. A true pioneer. Om can teach you how to honor your body as a sacred temple so that you can harvest abundant joy, health and positivity each and every day. Om resides in LA with his husband Dustin and their vegan fur baby Cooper. They spend their days cooking and creating new recipes to share with the world. Sign up with your email address to receive Om's amazing recipes, special offers and more! No spam guaranteed. Only good vibes.